Exciting times for Freddie Glitch. 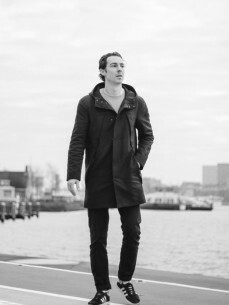 Not only has he hit upon a rich vein of creative inspiration and loving every second of being in the studio making music with his partner Fewture, this young man from Amsterdam also seems to be inadvertently, or maybe purposefully, shaping a fresh direction for the Amsterdam deep house scene. Taking up influences from Chicago via Detroit, London, Berlin and San Fransisco and with a broad knowledge of deep house, jazz, funk, soul and disco that goes way beyond his years, he managed to get close links and residencies at the Deep House Amsterdam movement as well as at the famous online magazine Overdose.am. His beats got support from names like Pete Tong, Shadow Child, Alle Farben, Waze & Odyssey, Nachtbraker, Jamie Trench and many others and brought him and Fewture bookings all over Europe. Amongst others, his sets were heard at P!TCH Festival Amsterdam, Boothstock Festival Rotterdam, at his residencies at sinnmusik*’s warehouse parties in Barcelona, the infamous LOK parties at Bourbon Dogs in Berlin and the Block Parties in Amsterdam’s Chicago Social club as well as all the major clubs in Amsterdam and Antwerp. Spring 2013 and 2016 even led him to China where he did two Asia tours! When Freddie performs, he confidently takes you on to an uncontrollable dancing state of mind, led by top notch energetic jacking deep house beats influxed with jazz and funk bits and with a love for vocal stabs throughout the whole set.